Maybe it’s the long-time roleplayer in me, but I love board games that provide a touch of that RPG experience. From the long nights of my youth spent playing Talisman to the modern era of Arkham Horror, Imperial Assault, and Gloomhaven. 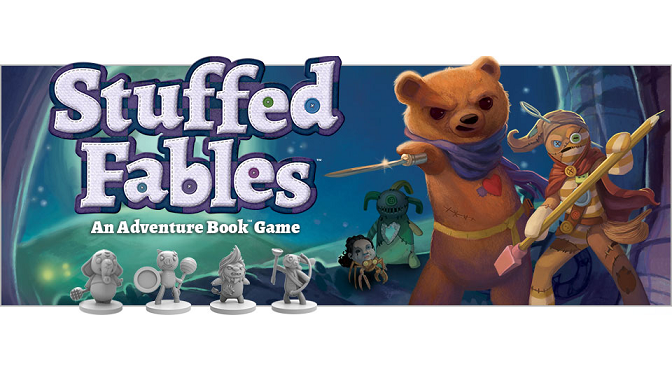 When I discovered Stuffed Fables, a game where you play stuffed animals on a journey into mysterious lands, I knew this was right up my alley. Where else can you explore the shadowy world under the bed, full of monstrous toys and their evil mastermind? Stuffed Fables is like many of these games, where each person plays a character (or two) during different scenarios. What you do in each scene can lead you to different results and further plots, as your tale becomes a “choose your own adventure” affected by die rolls. Like Imperial Assault, you have character cards with abilities, tokens, equipment cards, etc. You roll dice to accomplish skill tasks or defeat enemies, as you try to reach the goal of each scenario. The similarities begin to fade there, though, as Stuffed Fables uses two different mechanics: randomized dice pools and the unique “AdventureBook” that provides rules, story, and board in one. Each character turn, you start by drawing random dice from a bag. The different colors of dice represent healing, threats, and a variety of actions. Once you’ve picked your dice, your turn starts; moving past the healing and threat stage, you now can take as many actions as you have dice to roll. You could choose to move, attack, interact, help others, or even reserve a die to defend against future threats. All dice can be used to move, although the scenario may require specific colors to bypass difficult terrain or situations. The remainder is divided between melee attacks (red), ranged attacks (green), skill checks (blue), searching for items (yellow), or a “wild” die (purple). These colors are important because what you draw may limit what you can do. You might want to fight that creepy, doll-headed monster, but if you have no dice to attack with (or no weapon matching them), then you better look at other strategies. Also important is that the target numbers you need to reach may be difficult (or impossible) for a single die; you might need to use more than one die of the same color (or with a purple). Some scenarios may even include group tasks that require multiple players to contribute dice over several turns. I love this mechanic in games like Dice Masters and Quarriors!, and in an RPG-like game, it enhances the experience. Each turn becomes random, making you think about how to use the dice you’re given; also, rounds tend to move fast, as you only have so many actions you can perform with your pool. The unique aspect of the game is the AdventureBook, a book that works as rules, guide, and playmat all in one. When opened, the book provides a “board” (a picture with a grid and key icons) on one page, and the special rules and scenario progression on the other. This design provides far more portability and ease of use than games like Imperial Assault or Arkham Horror. The core rulebook is a mere 13 pages with any special rules listed in the scenario; similarly, setting up the “board” requires only opening the book and maybe placing a few tokens or figures. The AdventureBook also adds a very immersive experience, as you’re reading from a book while simultaneously playing on it. Moving from one scenario to the other is just as easy, allowing the story to flow and keep you engrossed. What amazed me about Stuffed Fables, as opposed to more complicated games, was how much my young son loved it. Although he’s “played” Imperial Assault, the complicated rules, tactics, dice, etc. were a bit beyond him. Stuffed Fables, on the other hand, was simple enough for him to grasp most concepts. He only struggled a little as a Kindergartner, which means this game is quite suitable for First and Second graders. The material and theme also work well for both children and adults. The idea of stuffed animals defending a young child from evil toys, read and enacted as a story, had my children enraptured and even my wife watching and listening. My main critique of the game focuses on miniatures and replayability. First, there is nothing wrong with the miniatures themselves; they are wonderfully designed and bring the game to life. I also appreciate that the bases of like models have different shapes, to help differentiate them and match them to their cards. I know that games with miniatures often look better painted, though, and that is something for which young children often have no patience (or skill). I’ve also known some players who see miniatures and assume it’s too complicated or requires too much work. Second, as enjoyable as the game is, there is some limit to replayability. The storybook only provides seven stories, each with about a half-dozen scenarios each. Given the more straightforward, quick style of this game, we were able to complete one story in several hours (even with distractions). If you play this game once a week with the same crew, you’d probably have played through every story in less than two months. Many fans are hoping that Plaid Hat Games releases expansions with new AdventureBooks, something that would substantially increase the lifespan of this game. 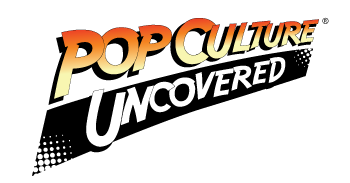 So far, however, they’ve only released a single new story, and just via downloadable PDF for players to print and play. Even with its limited stories, I find Stuffed Fables to be a fantastic game on multiple fronts. I love the RPG-like play, my family loves the child-oriented theme, and the unique mechanics of dice pools and AdventureBook make this game stand apart from others. While the game has no official solo mode, I do appreciate that it can still be played with two players. A single player could even choose to play several characters at once, and the rules scale the threats based on how many characters are in play. I hope Plaid Hat Games continues to support this game with expansions like Imperial Assault because I could easily see myself investing heavily into such a series. I might even paint the miniatures this time! Stuffed Fables is on shelves now. 2-4 players, 60-90 minutes, Ages 7+. I give Stuffed Fables a restless 4.5 red blankets out of 5.